A new nondestructive oilfield piping testing plant could breathe some life into an Abbeville economy struggling from another industry leaving town, officials said. Technical Industries of Houston broke ground Wednesday on a new facility near the Abbeville airport that will use Visonic 3-D imaging to test the strength of drill string, tubing and casing design. The new facility will bring in 50 to 100 jobs, “depending on the market, and the market looks good,” said CEO George M. Sfeir. The plat will serve Louisiana oil field customers with the technology, Sfeir said. Abbeville Mayor Mark Piazza said $300000 grant from the state will pay for improving the roads and running utilities to the site. State Sen. Nick Gautreaux, D-Meaux, worked with the state Office of Economic Development to secure the grant. 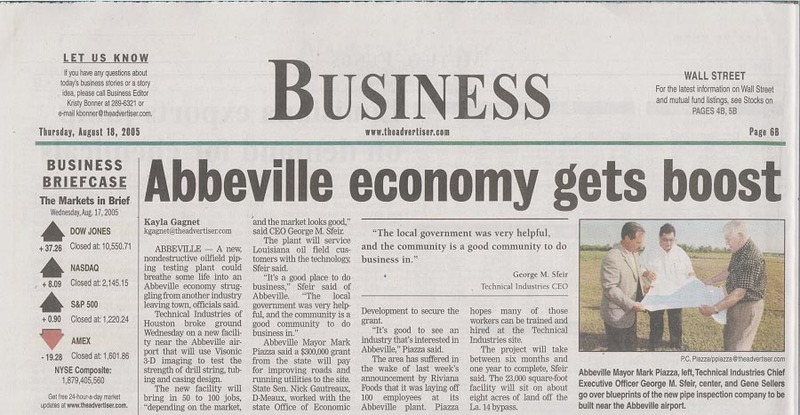 “It’s good to see an industry that is interested in Abbevill,” Piazza said. The area hhas suffered in the wake of last week’s announcement by Riviana Foods that it was laying off 100 employees at its Abbeville plant. Piazza hopes many of those workers can be trained and hired at the Technical Industries site. The project will take between six months and one year to complete, Sfeir said. The 23,000 square-foot facility will sit on about eight acres of land off the La. 14 bypass.